A complete 5-piece set of decanting essentials packed in one box. Contains one each of No. 9472 Pomerol Medium Decanter (1 qt. 22 oz. rim full, No. 9312 Decanter Ball Stopper, No. 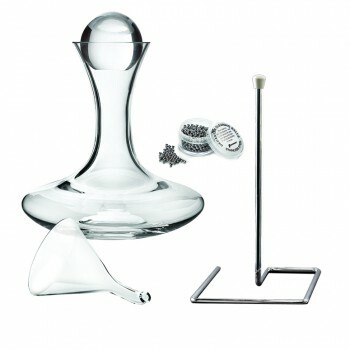 9305 Decanter Drying Stem, No. 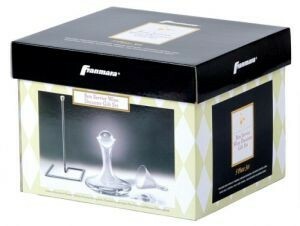 9314 Glass Decanter Funnel, No. 9495 Decanter Cleaning Balls, stainless steel. Measures 13-1/2" X 11-3/4" X 10 inches. Crystal decanters are made in Europe of lead free Crystal. Decanters are subject to dimentional weight when shipping. Please call for quotes. Imprint area: 3" X 2" on bowl of No. 9472 or 1" X 1"on decanter stopper. Laser Engraving available.